An electrocardiogram (ECG) records the electrical activity of the heart. The heart produces tiny electrical impulses which spread through the heart muscle to make the heart contract. These impulses can be detected by the ECG machine. You may have an ECG to help find the cause of symptoms such as the feeling of a ‘thumping heart’ (palpitations) or chest pain. Sometimes it is done as part of routine tests – for example, before you have an operation. Small metal electrodes are stuck on to your arms, legs, and chest. Wires from the electrodes are connected to the electrocardiogram (ECG) machine. 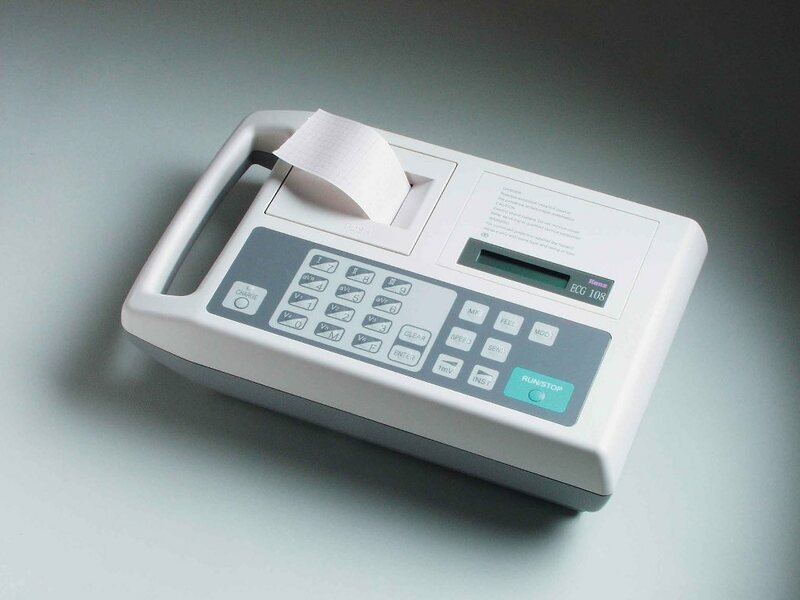 The machine detects and amplifies the electrical impulses that occur at each heartbeat and records them on to a paper or computer. A few heartbeats are recorded from different sets of electrodes. The test takes about five minutes to do. An ECG is a simple and valuable test. Sometimes it can definitely diagnose a heart problem. However, a normal ECG does not rule out serious heart disease. For example, you may have an irregular heart rhythm that ‘comes and goes’ and the recording can be normal between episodes. Also, not all heart attacks can be detected by ECG. Angina, a common heart disorder, cannot usually be detected by a routine ECG. Specialized ECG recordings sometimes help to overcome some limitations. Exercise ECG: In this test, tracing is done when you exercise (on a treadmill or exercise bike). This helps to assess the severity of the narrowing of the coronary arteries which causes angina. Ambulatory ECG: In this test, you wear a small monitor which constantly records your heart rhythm. This test records the electrical activity of your heart when you are walking about (ambulatory) and doing your normal activities. It aims to detect abnormal heart rhythms that may ‘come and go’. The electrical activity is usually recorded for 24-48 hours. This entry was posted in Lifestyle, medical equipments and tagged ECG for sale, ECG gauteng, ECG johanesbourg, ECG machine. Please send me a quotation for ECG machines, as some of your products are not showing. the first 10 to 15 minutes are usually lost just trying to figure out how to begin. Any recommendations or hints? It’s awesome to visit this web site and reading the views of all mates regarding this article, while I am also zealous of getting experience. After going over a few of the blog posts on your site, I really appreciate your technique of blogging. Hi. Very interesting content but it’s hard to find afrimedics.co.za in search results. What’s up mates, pleasant article and good urging commented here, I am in fact enjoying by these. of such information much. I was looking for this particular information for a very long time. could test this? IE nonetheless is the marketplace leader and a big component of folks will omit your great writing due to this problem. useful & it helped me out a lot. I hope to present something again and aid others such as you aided me. this point? I amazed with the research you made to make this particular put up incredible.